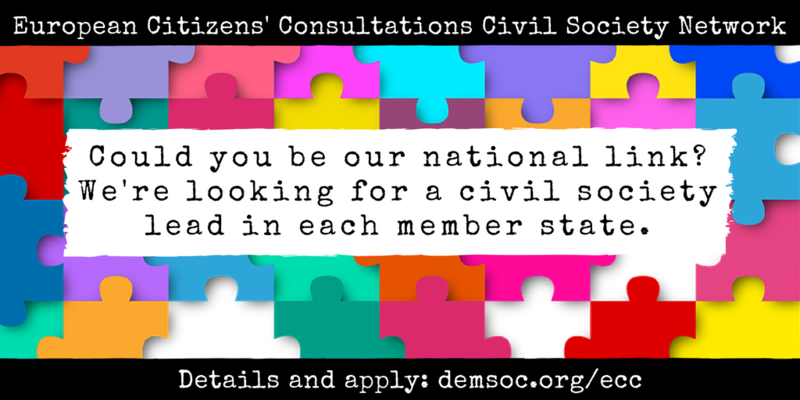 We’re building the network for civil society action on the European Citizens’ Consultations regarding the Future of Europe in 27 member states. We are meeting on a regular basis, remotely and in-person, to develop the network and share updates. Please join the mailing list to find out about future meetings and to help us shape recommendations for the future of European consultations. The European Citizens’ Consultations (ECCs) were formally launched by President Emmanuel Macron in April and now they’re happening in 27 member states of the EU. The European Commission have also launched a digital consultation based on questions developed by a Citizens’ Panel in May. Keep the ideas and thinking that emerge in the course of the consultations alive across the European elections and the new European Commission, to ensure that the results and the relationships created by the process are not lost. The network will work through online communication and regular meetings, with virtual participation possible. It will provide shared resources for civil society bodies working on the ECCs, and link the ECCs’ work into the wide range of existing democracy and open government initiatives.